In this series of the History of Wakeboarding we are going to go through the evolution of Wakeboarding and how it has changed. Over the series of multiple blogs we will discuss the major stepping stones that have helped revolutionize Wakeboarding from 1985 to 2019. This post will focus on the start of Wakeboarding and how it became a sport. In 1985 Tony Finn was a waterskier and surfer in San Diego. He always thought water skiing was boring so that is when he decided to combine surfing and water skiing and called it skiboarding. Skiboarding is what eventually turned into Wakeboarding. 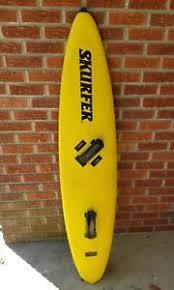 Tony created the “Skurfer” which was a board that was a combination of a water ski and a surfboard, more narrow than today’s wakeboard. Shortly after creating the Skurfer came foot straps. It had become evident that straps could open up the sport to bigger tricks and a lot more air. Around the same time Jimmy Redmon was also coming up with alternatives for waterskiing and surfing. He was creating is own version of the wakeboard at the time through his company Redline Designs. Tony was passionate about skiboarding and spent years trying to grow the sport and popularize it. In 1990, Skiboarding made it onto ESPN to televise the first Skurfer Championships. Skiboarding struggles to take off, until Herb O’Brien designed and introduced the first ever compression molded neutral buoyancy wakeboard. This new board was called Hyperlite and allowed for easier deep water starts and opened up the sport to more demographics. O’Brien continued to innovate and make changes to boards. Tony and his friend Jimmy eventually went on to start Liquid Force. They revolutionized the sport again by introducing the first ever twin-tip wakeboard. They called it the Flight 69, the design empowered riders to land and ride switch. Adding switch riding to the sport has opened up the possibility of new spins and grabs. Read the next post in the series here! Follow us on Instagram and like us on Facebook to see all our posts!